Learning at the Kindergarten is designed to be an enjoyable experience for children, thus making them want to come to school every day. By increasing student interest, by making learning fun but meaningful, we lay the foundation for developing a lifelong interest in learning. 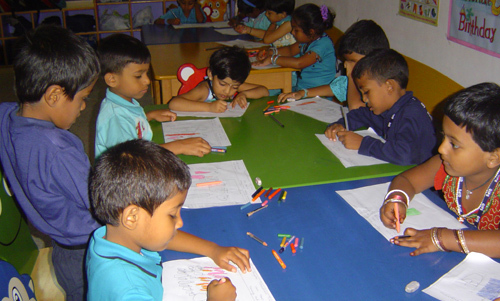 Children learn through playing games, songs, sports and creative activities. Kindergarten creates an atmosphere where children feel respected and secure by providing a place of warmth, fun, joy and laughter for the little ones. Children are taken out on a nature walk where they observe the beauty of God's creation. 'Wonder World' in the Kindergarten is a place where children reason out and start to think and express themselves on any discussion. The play pen is a place for fun, where students start to mingle with their peers and slowly gain confidence. This area is built on child safety measures, thus preventing children from injuring themselves. 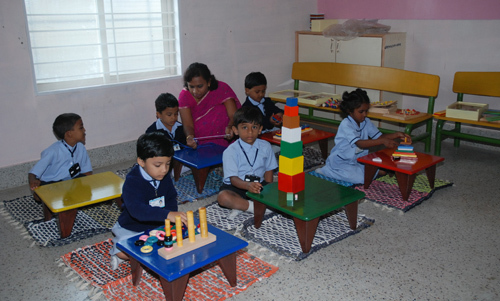 Every class in the Kindergarten has an activity corner, where the teacher helps the children to setup the corner based on the topics. Active board is another useful aid which is used by the teachers of the Kindergarten on a one-to-one interaction with their students. Children are taught to discipline themselves and bring their body, mind, and spirit at peace and in harmony with nature. To keep them fit and healthy, the students are taken out to the playground every day. Children become alive and active during their Music period. They have a lot of fun whether it is learning new songs or rhymes. Every term the Kindergarten children are exposed to the world around them by field trips to parks, farms, museums etc. 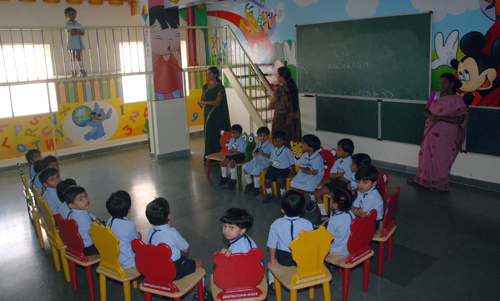 These visits are educational and fruitful to every child where they get inspired and motivated. Every festival is Celebrated on a grand scale e.g., Fruit Salad Day, Children's Day, Christmas, Diwali, Sankranthi, Onam etc, make the Kindergarten Block colourful and is always in a festive mood.